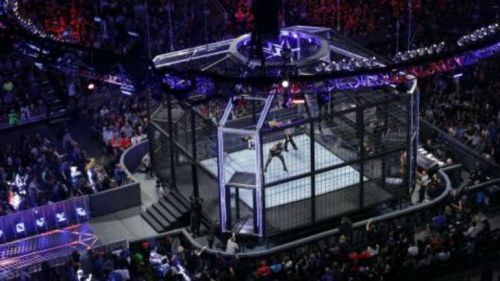 The first Elimination Chamber match took place at Survivor Series 2002 in Madison Square Garden. Since it's inception there has been 22 Elimination Chamber matches, with two more to take place this Sunday. The match was based around the concept of the old WCW War Games matches. Triple H pitched the idea and originally sketched it on a napkin. It has become a staple of WWE gimmick matches and has been given its own pay-per-view since 2010. The match has been used to crown number one contenders and is the last chance for wrestlers to guarantee themselves a WrestleMania main event. Despite the popularity of the match its records and statistics are not valued as much as those of The Royal Rumble match. For some odd reason, the records are not recognized as much as the Rumble records. That is why I wanted to take a look at some of the statistics of Elimination Chamber matches through the years. No other wrestler in the history of the WWE has competed in more Elimination Chamber matches than Chris Jericho. Jericho has entered the Chamber eight times over the years. John Cena is in second with seven entries. Randy Orton currently has the third most entries with six and will tie with Cena when he competes in his seventh Chamber match this Sunday. Triple H has also entered the match six times and Kane has been in five matches. Kofi Kingston will enter his fourth Elimination Chamber match this Sunday when he replaces the injured Mustafa Ali. Last year saw the first ever women's Elimination Chamber match take place. Bayley, Sasha Banks, Mandy Rose and Sonya Deville competed in that match and will make their second appearance in the women's tag team title match this Sunday. Best and worst of WWE Elimination Chamber 2019: The Kofi Kingston show!